Stop! Hammertime. You can’t touch this! That, dear folks, is a male anti-masturbatory device from around the start of the 20th century in Great Britain. 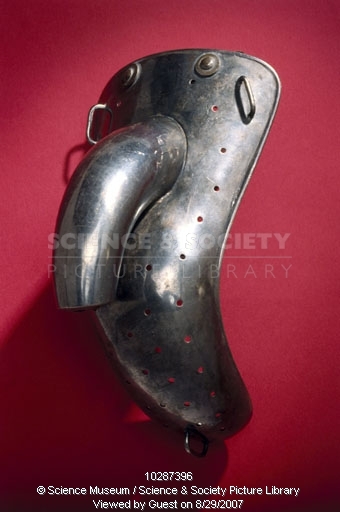 This metal device is one of a number of similar devices which were invented in the 18th, 19th and 20th centuries to prevent masturbation. A leather strap which would have kept it in place is now missing. Until the early 1900s, many people regarded masturbation as harmful to a person’s health, and it was blamed for a variety of ailments, including insanity. Author ragmanxPosted on September 1, 2007 September 3, 2007 Categories Random Ramblings, Useless knowledge, WTF?